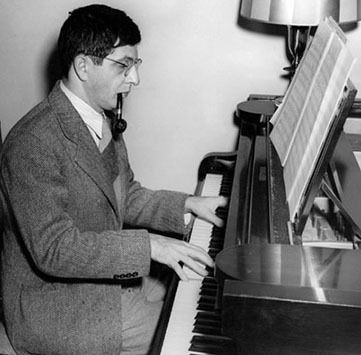 Today marks the 100th anniversary of Bernard Herrmann's birth (let's call it his 100th birthday). I've always cited Herrmann as my favorite 20th Century composer. In fact he was my introduction to orchestral music in general. Back when I was deep into experimental music and free jazz, I used to comb through old thrift stores for kitschey records to sample/collage. One time I found a 99 cent cassette of the original score recording to Herrmann's "The Day the Earth Stood Still". I was literally blown away at how awesome this score from the 50's was. For me as an electronic musician, the 2 theremins, electric basses and organs were a perfect entry point into film score music. From there I collected ALL of Herrmann's works, as well as the best stuff from Goldsmith, North, Steiner, Waxman, Korngold, Elfman, Horner, Morricone, etc... However Herrmann was still way ahead of every other film music composer in my estimation...one of Bennie's infamous claims is that he did all the orchestrations of his music himself - and that most film composers didn't. I think that had alot to do with the uniqueness of his sound...his wind writing is almost immediately recognizable. Main Title from "The Day The Earth Stood Still"
"the score included electric violin, electric bass, 2 theremins* (treble & bass), test oscillators, vibraphone, 4 pianos, 4 harps & approximately 30 brass instruments"
Finally, both had a prodigious talent for writing very simple motifs and "exploding" then into orchestral masterpieces. "Death Hunt" from "On Dangerous Ground"
Transcript of a lecture given by Bernard Herrmann at the George Eastman House Museum in October, 1973.